Born 1978 in Sandviken, Sweden. He started playing doublebass at the age of 10. In 1997 he began his studies wih Anders Jormin at the College of Music in Gothenburg. For the last 20 years he has worked and toured with a lot of Swedish and foreign musicians. 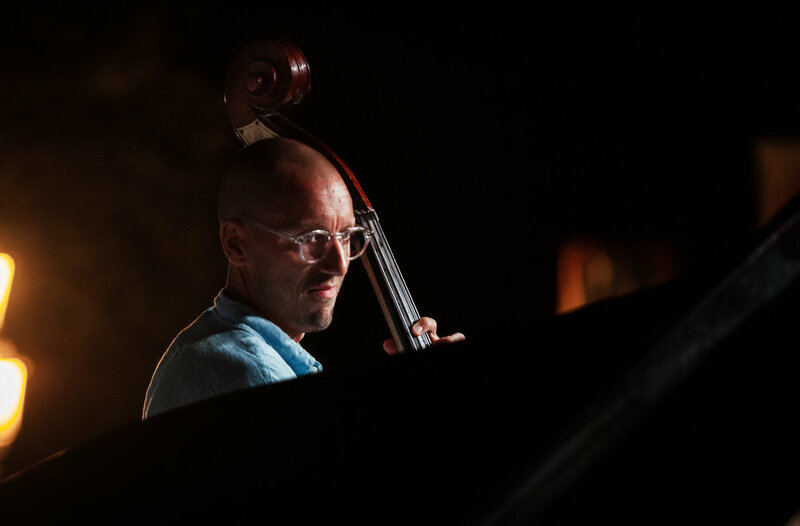 Thomas is a member of Corpo and Walter Lang Trio and he is also working with his own project “OPEN” with Naoko Sakata, Staffan Svensson and Cornelia Nilsson. Over the years he has performed on a number of records with different jazz groups. 3/2 18.00. Concert at Backa Kyrka with Daniel Lindén and choir. 20/3 19.00. Concert at Stenhammarsalen, Gothenburg. 6/4 20.00 Trio with Naoko Sakata - piano, TM - bass and Shinya Fukumori - drums at Unity, Gothenburg. 8/5 21.00. Corpo at Jacques Pelzer Jazz club, Liége, Belgium. 9/5 19.00. Corpo. Paris, France. 10/5 21.00. Corpo at Jazz ô Chateau Festival, Bretagne, France. 14/5 19.00 A night at the opera. Tribute to Queen. Lorensbergsteatern, Gothenburg. 15/5 19.00. A night at the opera. Tribute to Queen. The Gothenburg Opera, Sweden. 16/5 19.00. A night at the opera. Tribute to Queen.Skara, Sweden. 24/5 21.00. Corpo at Görlitz Jazz Festival, Germany. 26-30/6 Teaching at Bangen Jazz Collective. 21-23/7 Recording with Walter Lang and Magnus Öström in Udine, Italy. 26/11 Walter Lang Trio in Tokyo, Japan. 27/11 Walter Lang Trio in Osaka, Japan. 28/11 Walter Lang Trio in Okayama, Japan. 29/11 Walter Lang Trio in Fukui, Japan. 30/11 Walter Lang Trio in Furukawa, Japan. 1/12 Walter Lang Trio in Iwaki, Japan. 2/12 Walter Lang Trio in Masuda, Japan. 3/12 Walter Lang Trio in Fukushiyama, Japan. 4/12 Walter Lang Trio in Nagoya, Japan. 5/12 Walter Lang Trio in Kofu, Japan. 18-20/1 Recording with OPEN at Hagakyrkan, Gothenburg. 18/4 Corpo at Viljandi Jazzclub, Estonia. 19/4 Corpo at Kanepes Culturas Centr, Riga, Latvia. 20/4 Corpo Pärnu Jazzclub, Estonia. 21/4 Corpo at Rakvere Jazzclub, Estonia. 19/5 Anders Persson Trio at Herr Nielsen Oslo, Norway. 26/6 - 1/7 Teaching at Bangen Jazz Collective, Sandviken. 5/7 Walter Lang Trio at Le Pirate, Rosenheim, Germany. 6/7 Walter Lang Trio at Kulturetage Messestadt Riem, Germany. 7/7 Walter Lang Trio at Unterfahrt, Munich, Germany. 9/7 Walter Lang trio recording in Udine, Italy. 3/8 Anders Persson Trio Festival in Neaples, italy. 14/8 Corpo at Kulturkalaset Gothenburg, Sweden. 16/8 GWO at Götaplatsen Kulturkalaset, Gothenburg, Sweden. 27-30/8 Teaching at NoCom, RMC, Copenhagen, Denmark. 9/10 Release Tour Thomas Markusson OPEN, Fasching Stockholm, Sweden. 10/10 Release Tour Thomas Markusson OPEN, Ingesunds Musikhögskola Arvika, Sweden. 11/10 Release Tour Thomas Markusson OPEN, Studion Umeå, Sweden. 12/10 Release Tour Thomas Markusson OPEN, Nefertiti Gothenburg, Sweden. 3/11 GSB at Konserthuset, Gothenburg, Sweden. 9/11 Corpo at Swiss Radio in Lugano, Switzerland. 9/11 Corpo at Rosentum Jazz Festival, Milan, Italy. 14/11 Walter Lang - piano, Magnus Öström - drums and TM - bass at Sonnenalp, Germany. 25/11 Walter Lang Trio at Haus am Meer, Fukui, Japan. 26/11 Walter Lang trio at B-flat Tokyo, Japan. 28/11 Walter Lang Trio in Masuda, Japan. 29/11 Walter Lang Trio in Fukuchiyama, Japan. 30/11 Walter Lang Trio in Shizuoka, Japan. 1/12 Walter Lang Trio in Furukawa, Japan. 2/12 Walter Lang Trio in Iwaki, Japan. 14/12 Walter Lang Trio in Osaka, Japan.